Cheers, yodels, and songs immediately engulfed both sides of our vehicle. We turned onto a small pathway shaded by palms. We were bordered by smiling and cheering farmers, mostly women, rushing out to greet us. As we drove further up the path, they fell into a parade-like formation that followed us, erupting in songs that seemed to get louder and louder. The volume of the celebration only increased once we opened our doors to get out. These changes in farming practices seem simple, but they make an incredible difference. One after another, people told me that in places where sustainable practices had been adopted, weather patterns were normalizing. The land was now lusher, and people saw their lives improve. “The double-dug garden beds produce two-and-a-half times more vegetables,” cited another participant. As I recalled how these farmers depended on this growth for their families’ survival, that sort of growth struck me as a big deal. These farmers planned to share with me their farming lessons, but I didn’t realize they would also teach me the meaning of celebration. 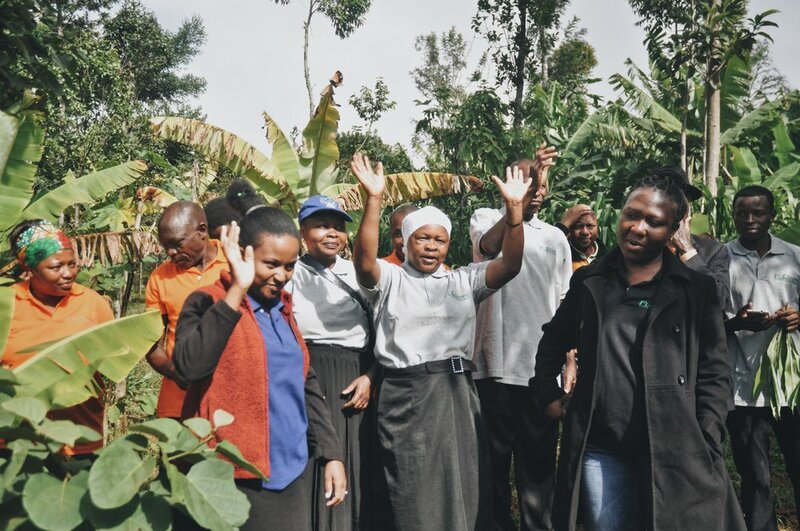 I considered my joy-filled encounter with the Farmer Field School in Moshi-Marungi a once-in-a-lifetime sort of experience. Then it happened again. We were greeted with the enthusiastic cheers, celebrations, shouts, and songs the next day when we drove into the village of Rombo. It happened a third and fourth time that week when we visited a group of Farmer Field schools, then a savings group in Siha. Of course, it never got old. That’s when it struck me that karibuwas not just a Swahili word for welcome. It’s one of the first words a visitor will pick up in East Africa, but beyond its literal translation, it’s a spirit embodied in the lives and practices of these communities. In action, karibu didn’t just mean welcome, it meant we are thrilled like crazy that you’re here and we can’t wait to show you what’s going on! I think of all the people in our world for whom a little acknowledgement and a little invitation would go a long way. Being invited into something, especially something transformational, is the deepest form of affirmation. Jesus constantly uses images and stories of feasts and celebrations to show us what it looks like to be in God’s presence. There’s a great wedding reception meant to represent this in Matthew 22, and in Luke 15 when a prodigal repents, the father celebrates with music and dancing. On earth, any glimpse we get of genuine joy is a taste of God’s kingdom. Any time we experience a moment of delight over something God has done or made, we get a taste of the kingdom as well. It was impossible to listen to her speak without getting excited myself. True joy and celebration is contagious, and that is a good thing. Every village needs more joy, whether that’s a rural village on African mountainsides or my coastal San Diego neighborhood. Tanzania is a great place to learn about living a life of joy, where you celebrate as you go. Work can be difficult, life can be hard; there is still lots of room to celebrate together every day!